Travelers are voting Kyalami, Prince George Circuit and Durban Street Circuit as the best of 5 race tracks in South Africa. 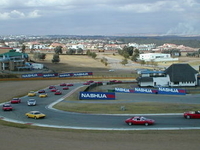 Also popular are Killarney Motor Racing Complex in Western Cape and Phakisa Freeway in Welkom. Want more? Check out our map of race tracks in South Africa or this 1 race tracks near Durban. Killarney Motor Racing Complex is a motor racing complex in Cape Town, South Africa. It first saw action in 1947.